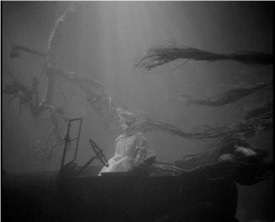 "The Night of the Hunter" (Charles Laughton, 1955): The image of the lifeless Winters underwater, still seated in her car, the long blond hair of her corpse waving in the current like seaweed, is perhaps the most surreally powerful and haunting image of death the movies have ever given us. 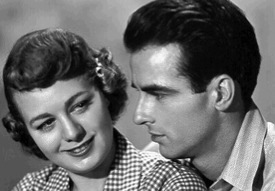 "A Place in the Sun" (George Stevens, 1951): Winters got her first Oscar nomination for this film (the Hollywood version of Theodore Dreiser's "An American Tragedy"), in which Montgomery Clift rows her out into Loon Lake with ambivalent feelings about gettin rid of her forever... in a scene with ripples of Munau's masterpiece, "Sunrise," flowing through it. Charlotte; Hum, you just touch me and I... I... I go as limp as a noodle. It scares me. 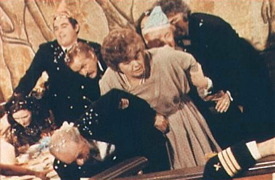 "The Poseidon Adventure" (Ronald Neame, 1972): Winters' fourth Oscar nomination (she won for "A Patch of Blue" and "The Diary of Anne Frank") was for Belle Rosen, the tubby swimmer who was probably a cousin of Charlotte Haze. It says a lot that she -- a heroine both whiny and plucky, comic and noble -- is probably the only passenger on the Poseidon that you care about. Or even remember an hour after the movie's over. Graham Fuller: [Charles] Laughton directed you in "The Night of the Hunter." How did he film you in that incredible underwater shot where your character is drowned, her hair drifting like seaweed?